Michelia is a genus of flowering plants belonging to the magnolia family (Magnoliaceae). The genus includes about 50 species of evergreen trees and shrubs, native to tropical and subtropical south and southeast Asia (Indomalaya), including southern China. 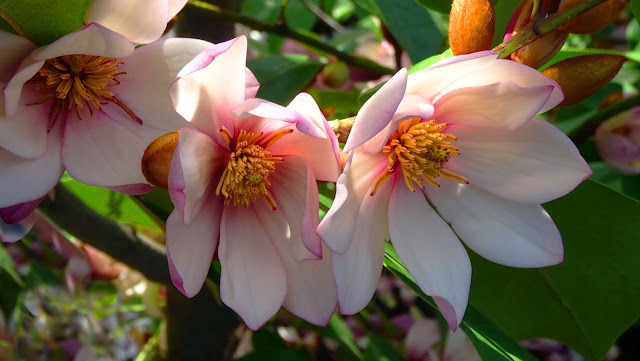 The Magnoliaceae is an ancient family; fossil plants identifiably belonging to the Magnoliaceae date back 95 million years. A primitive aspect of the Magnolia family is that their large, cup-shaped flowers lack distinct petals or sepals. The large non-specialised flower parts, resembling petals, are called tepals. The leaves, flowers, and form of Michelia resemble Magnolia, but the blossoms of Michelia generally form clusters among the leaves, rather than singly at the branch ends as Magnolia does. Popular in Melbourne is a relatively new hybrid of Michelia, called 'Fairy Magnolia'. This is designated Michelia x MicJUR01 and was bred in New Zealand by Mark Jury in the late 1990s. It produces masses of beautiful fragrant flowers blushed with lilac-pink in early Spring. These plants are so free flowering that they have a flower bud at each leaf axil and have been known to provide a light flush of flowers during summer too. The plants are bushy with rich evergreen foliage, which makes them ideal in the garden as a flowering hedge or specimen plant. Pretty name, pretty blossoms. Thank you for hosting.